Easily implement branched Surveys and Quizzes, including all types of question: Drop-downs, Radio Buttons, Checkboxes, rating scales and more. The Survey Plus web part connects to a standard SharePoint Survey list, including remote surveys located in other sites – enabling you to easily implement cross-site polls! The surveys’ results can be displayed in various types of great looking charts: Horizontal Bar, Vertical Bar, Line, Area, Pie, Spline, Bubble and Point. 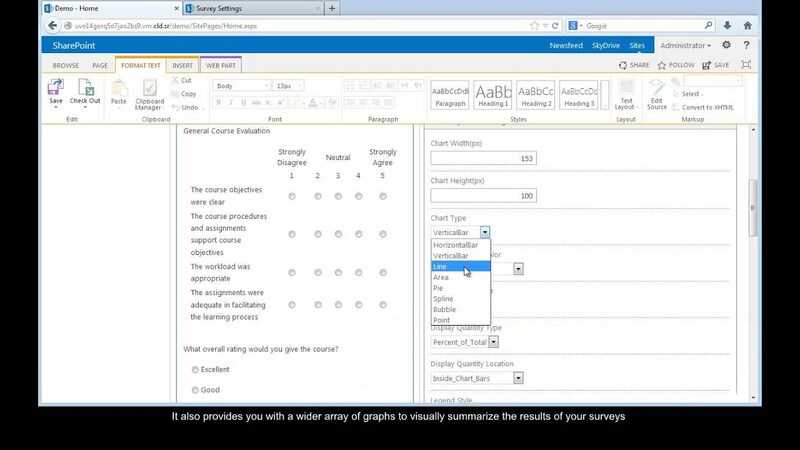 Survey Plus enables you to divide a Survey/Quiz into several pages, and define which questions are displayed in every page (this is simply defined by using the standard SharePoint Survey list’s separator column). Users can navigate between the pages using “Next” and “Back” links. Survey Plus web part support also Branching, which allows you to implement interactive questionnaires – different questions are displayed according to users’ answers. The new Quiz mode allows users to save the questionnaire and later to pick up right where they left off. KWizCom Survey Plus is especially designed for customizations; using the web part’s CSS & XSL files you can fully customize the web part to support your specific business needs!